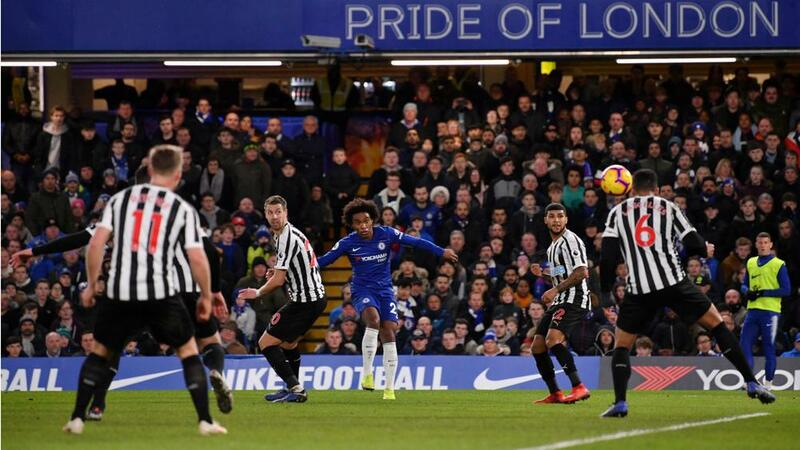 Willian scored a brilliant winner as Chelsea battled to a 2-1 Premier League victory over Newcastle United at Stamford Bridge on Saturday. Pedro opened the scoring with the help of a classy assist from David Luiz, but the hosts were pegged back by a Ciaran Clark header shortly before half-time. The points were Chelsea's, however, thanks to Willian's curling strike 12 minutes into the second half. Newcastle offered little going forward after falling behind for a second time, as fourth-placed Chelsea pulled six points clear of Arsenal. Chelsea took just nine minutes to go in front, with Pedro getting on the end of a wonderful David Luiz ball from his own half to delicately chip over the onrushing Martin Dubravka. Luiz almost added his own name to the scoresheet in the 25th minute, when his close-range header deflected over the crossbar, before Florian Lejeune registered Newcastle's first shot of any description – a tame volley from outside the box that was comfortably collected by Kepa Arrizabalaga. Salomon Rondon should have done better when he blazed wide following a neat exchange with Christian Atsu after half an hour, and Ayoze Perez stabbed a strike just off target as Newcastle threatened an equaliser. The visitors had their leveller five minutes from half-time, when Ciaran Clark powered home a header from a Matt Ritchie corner. Willian dragged wide with a chance at an instant reply and Dubravka produced a superb save to deny Pedro less than two minutes into the second half. The Spanish winger then scuffed a shot from the centre of the box in the 56th minute but Willian had Chelsea back in front soon after. Given the space and time to plot his next move on the left of the penalty area, Willian cut inside and curled a beautiful strike beyond Dubravka. Newcastle had appeals for a penalty turned down after Perez went down softly under the challenge of Antonio Rudiger and, after Willian had a chip saved by Dubravka, Rondon headed wide from a rare opportunity to restore parity four minutes from time. Arsenal's defeat at West Ham earlier on Saturday, followed by a win for Chelsea, means there is now clear daylight between the top four and the chasing pack. Newcastle, meanwhile, will end the weekend in the relegation zone, a point behind 17th-placed Cardiff City. Reports earlier this week suggested Barcelona had renewed their interest in bringing Willian to Camp Nou and his intervention on Saturday demonstrated why. The Brazilian assessed the situation before creating the angle with one touch and curling a world-class finish beyond Dubravka. Luiz had an action-packed first half for Chelsea, highlighted by his excellent assist for Pedro's opener. But he was also the closest defender to Clark as the Newcastle man found enough space to plant a header past Kepa. Chelsea head to Arsenal next weekend, while Newcastle host fellow strugglers Cardiff City after travelling to Blackburn Rovers for an FA Cup third-round replay.